So you've probably heard about the alleged theft of our C-line prototypes, which lead to some suspicious clues and finally an outcome represented in a Disc Golf short movie called "the Great Escape". If you haven't followed the story so far, check out the handy links. So one might think that the story ends here - we are pushing out the C-line starting on March 7th and hope you guys like the new discs. We sure do. But there's one more last bit to the story. See the destiny of the discs weren't fully explained in the short movie. So at first we made you all worried about the whereabouts of our missing protos (yeah, sorry about that). Well now we'd like to offer you guys a chance to find yourselves a piece of the missing protos. 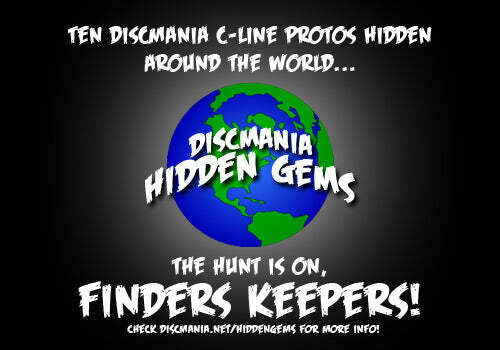 See we've hidden ten of them in undisclosed locations around the globe, waiting for you guys to hunt them down. Check the Hidden Gems -page for the clues on how to find yourself a piece of our "missing" protos. Follow our facebook-page in order to stay on top of the latest revelations on this story. And if you're lucky enough to find one, please let us know by dropping an email to janne.lahtinen[at]discmania.fi!